* professionals registering for two or more ADOS-2 or ADI-R training courses within a calendar year will receive a $150 discount. 2 ½ day ADVANCED/RESEARCH training on administration and coding of the ADOS-2. Clinical Supervision is part of the training and begins prior to the training and continues past the training (for up to one year) with the certified trainers. 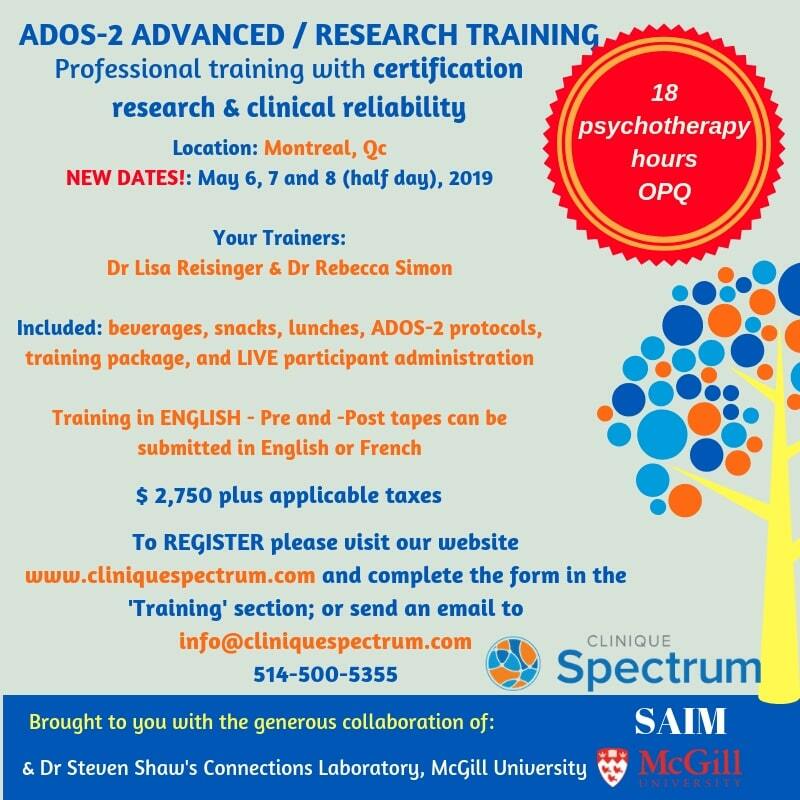 An ADOS-2 research training workshop is only available to those who have completed the in-person clinical training workshop. Research training focuses on bringing participants’ scoring skills to a high level of inter-rater agreement with the scoring practices of skilled examiners. The heightened level of accuracy is needed to ensure that item-level coding is comparable at different sites in different parts of the world where research is being conducted. The training takes place over two-and-a-half days and participants have the opportunity to administer parts of two different ADOS-2 modules with volunteers with ASD. Please write to us to receive our application and information regarding responsibilities prior and during the workshop. Please bring your ADOS-2 manual with you to the training course. Manuals can be purchased at MHS or WPS.